We’ve seen some amazing Airbnb rentals over the years, from the wallet-challenging luxurious to the jaw-droppingly cool. The accommodation site’s most popular listing globally slips neatly into the latter category, offering guests a comfy stay in a quirky dome-topped cabin. Airbnb revealed its most popular listing this week as the company celebrated half a billion guest arrivals globally since its launch in 2008. 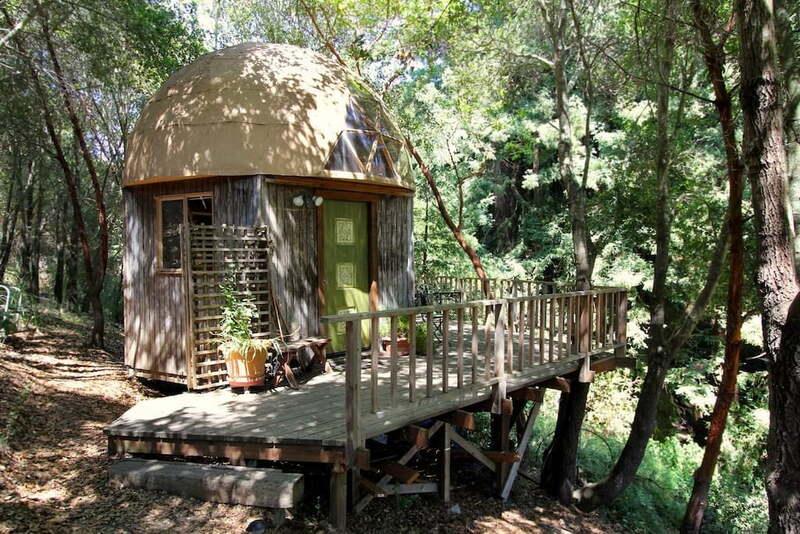 The Mushroom Dome Cabin, as it’s called, is located in Aptos, California, about 60 miles south of San Francisco. The Dome has actually been Airbnb’s most visited listing for a number of years now, with guests attracted by its offbeat design, cozy interior, and secluded location. The semi-rustic cabin features a loft beneath the geodesic dome, inside which you’ll find a queen-size Casper mattress that should ensure a decent slumber. A second couch/bed on the main floor means the place can sleep three guests. Also on the main floor of this unique 100-square-foot property is a well-equipped kitchen area and pull-out table. There’s another table out on the deck, which is also home to a barbecue grill for cooking up a feast. The Mushroom Dome Cabin has hosted guests from around the world, though with a wait of up to 11 months for a weekend booking, the biggest challenge appears to be getting the desired dates. Still, a cursory glance at the mostly glowing reviews suggests it’s well worth the wait. Since its launch just over 10 years ago, Airbnb now offers around six million places to stay in more than 80,000 cities around the world. Three guests check into an Airbnb listing every half-second, so says the company. But success has come at a price with some sections of the hotel industry upset that Airbnb hosts generally face fewer regulations when it comes to setting up and running their business. Laws are starting to change, but as with other disruptive platforms, the authorities are taking time to catch up. Long-term renters in some larger cities also feel pressured by rising prices caused by a shrinking pool of rental homes as owners decide to switch their properties to more lucrative short-term accommodation that operate via services like Airbnb.